Group photo of Famous Artists School Faculty. 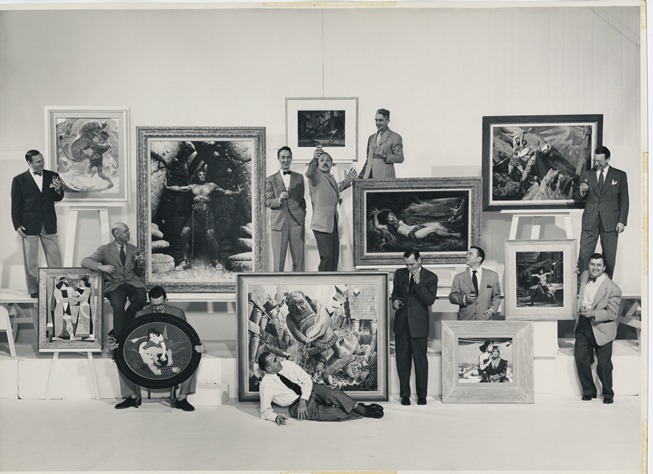 Left to right: Harold von Schmidt, John Atherton, Al Parker, founder Al Dorne, Norman Rockwell, Ben Stahl, Peter Helck, Stevan Dohanos, Jon Whitcomb, Austin Briggs, and Robert FASwcett - © Norman Rockwell Museum Collections. All rights reserved. After World War II, American education boomed. Armed with GI Bill funding, veterans wanted to quickly convert new, practical skills into careers. Self-improvement courses completed at home became increasingly popular. Through a correspondence course, participants learned how to repair radios and watches, raise rabbits, correct a stammer, and play a musical instrument. The Famous Artists School (FAS), once Westport’s largest business, captured that energy by marketing a wildly popular set of commercial art courses. Though over-expansion, scandal, and changing technologies later diminished its luster, its story is one built on the American Dream. In 1948, charismatic illustrator Albert Dorne had an idea. He approached America’s most famous working illustrator, Norman Rockwell (known for his idealized depictions of American life on the covers of the Saturday Evening Post), about creating a correspondence school for commercial art, full of tips, methods, and case studies to appeal to those who dreamed of becoming an artist. Dorne and Rockwell made a formidable team. Rockwell’s fame and modest demeanor balanced Dorne’s man-about-town persona—with his perennial cigar and bushy eyebrows inviting caricature. With the addition of another ten founding artists, the school opened in October 1948 in the old Sasco mill by the Saugatuck River in Westport, Connecticut. Each founder devised a distinctive curriculum marketed to prospective students, but when most students only expressed interest in Rockwell’s course, the initial model quickly became untenable. 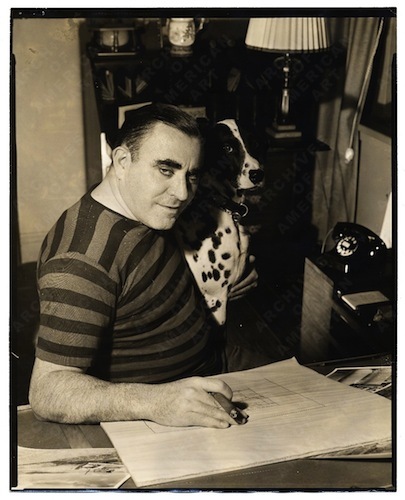 Al Dorne and Norman Rockwell – © Norman Rockwell Museum Collections. All rights reserved. Regrouping, the founders created one set of instruction manuals, and FAS leveraged Rockwell’s fame to attract students. “Art school for everyone everywhere” read one FAS ad, which ran in the back of magazines such as TV Guide and Life. For $200, or GI benefits, the student received large binders containing 24 lessons. After completing each lesson, the student mailed the resulting art in a large, flat envelope to Westport. On-site instructors, working under the direction of guiding faculty, then critiqued the student work by drawing or painting corrections on a tissue or acetate overlay. Charles Reid, who joined FAS in 1963 as its youngest instructor, noted that with the early lessons, students received a stock letter response according to their skill level. By lesson eight, the instructors sent personal critique letters, with marked-up art, back to the student. Reid recalls recording his letters by Dictaphone, completing three critiques a day. Students included celebrities such as Tony Curtis (who gained recognition for his easel paintings), Charlton Heston, Pat Boone, and Dinah Shore. 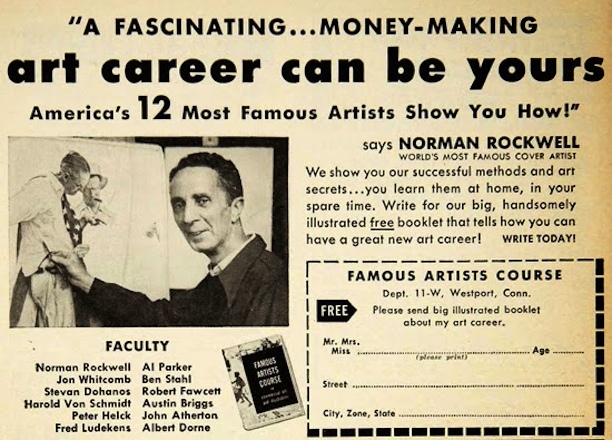 Norman Rockwell, “World’s Most Famous Cover Artist”, featured in a Famous Artists Course advertisement. In its heyday in the 1950s and 1960s, 50 instructors, all men, worked side-by-side in a bullpen of cubicles, full of camaraderie. Instructor perks included attending lectures by the school’s founders. (Students had no contact with the founders.) When Charles Reid impressed Norman Rockwell with a portrait he created, the young instructor received several invitations to join the icon for lunch. Uniquely, Reid started with FAS as a 15-year-old student, when his father bought him the course. He only completed eight of the original lessons, then abandoned the course, citing its difficulty. Adding to the company’s troubles, Jessica Mitford published a career-making exposé of FAS’s sister organization, the Famous Writers School, in 1970. She revealed hucksterish sales tactics and the misleading pitch that famous figureheads evaluated student work. 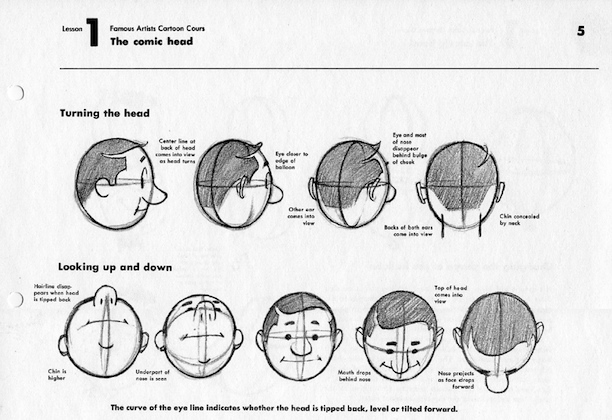 Detail from Famous Artists Cartoon Course, Lesson 1, “The Comic Head,” ca. 1956. Over-expansion and the Mitford article produced a backlash against FAS. Enrollment radically dropped. After changing ownership several times, FAS seemed to deplete its characteristic energy and good will, as well as its financial coffers. In 1981, Cortina International, successful with foreign language instruction, purchased the bankrupt business. The new owners revitalized FAS. They reorganized the curriculum, building on existing strengths, and oversaw a joyous 45th anniversary reunion in 1993. They established a lucrative relationship with a Japanese licensee, which had 14,000 students (when FAS only had 150). 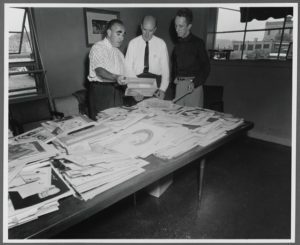 With instructors no longer working on site, FAS moved its operations to Wilton, but distance learning and art instruction became readily available online, and the world of commercial art shifted from hand-drawn, hand-painted illustrations to computer-generated work. Even with an online course, the FAS model of intensive home study and correspondence with an instructor became as nostalgically old-fashioned as a Rockwell magazine cover. The challenges brought on by the emergence of new technologies and educational models prompted the decision to close the Famous Artists School in 2016. Rena Tobey is an American art historian and lecturer. She is also the creator of the Artventures! Game—a party game based on adventures in art and art history. “Famous Artists School,” 2016. Link. “The Artists Who Founded Famous Artists School.” Famous Artists School, 2016. Link. “Digital Collections: Famous Artists School Collection.” Norman Rockwell Museum, 2016. Link. Dorne, Albert, David Apatoff, Manuel Auad, and Jack Davis. Albert Dorne: Master Illustrator. San Francisco, CA: Auad Publishing, 2012. Solomon, Deborah. American Mirror: The Life and Art of Normal Rockwell. New York, NY: Farrar, Straus and Giroux, 2013. Mitford, Jessica. “Let Us Now Appraise Famous Writers,” July 1970. Link.